My Spanish neighbor, Nina Tortosa, invited my family over for dinner on Mother’s Day. Her parents, Pedro and Nina, were in town from Minnesota and her Dad was going to make seafood paella. Paella is a saffron-flavored Spanish dish made with rice, vegetables and varying combinations of rabbit, sausage, chicken, and seafood. 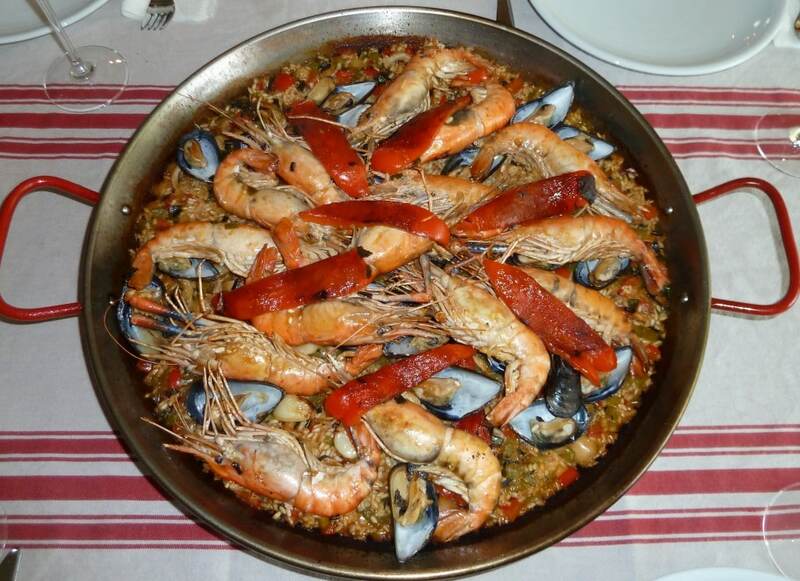 There is a special pan for preparing paella called a “paellera”. Pedro also had a special burner that fit the bottom of the pan perfectly. Pedro started with the flavor base “sofrito” of sauteed onions and tomato. Many vegetables were chopped ahead of time including, scallions, tomatoes, celery, green and red peppers. Garlic was left whole, but a slit was made in each clove to keep it from bursting in the cooking process. Olive oil is an important ingredient. The seafood included, shrimp, clams, mussels and calamari. It was as delicious as it was beautiful. We had gorgeous weather for Mother’s Day. It couldn’t have been a more perfect day. I made a big pitcher of Sangria. After a quick Google search, I learned that there are a lot of ways to make Sangria. It’s basically red table wine mixed with a little sugar and a lot of fruit. Traditionally, it includes oranges and peaches. I added 2 sliced oranges, 1 lemon, an apple, and frozen blueberries. I also added a splash of pomegranate juice. Everyone loved it. I tried to capture each step of Pedro making his delicious seafood paella in this slide show. Enjoy! Feliz Día de la Madre!